Today net petroleum imports are on track to drop to their lowest level since Lyndon Johnson was president. With numbers like that, the energy revolution has had a real impact on Americans – and not just at the gas pump. U.S. natural gas and oil supports 10.3 million jobs – up more than a million and growing. Strong oil and gas production helped lead the country out of the 2008 recession; Purdue University economists said the recession would have lasted years longer without it. It’s been a game-changer -- for the economy, for politics -- and for policy. America is safer and stronger as a nation when the energy industry is strong. Every other industry depends on affordable and reliable flows of energy. And when the world’s military superpower is also the world’s energy superpower, our national security is strengthened, and we have more options to achieve our geopolitical objectives. That’s what U.S. energy leadership means. But, as you well know, we can’t rest on our success. We have the resources, the workers and the technology to keep going. But we also need the right policies to sustain the momentum. That’s what I mean by: energy dominance starts in Texas, and we must make sure it doesn’t end in Washington – now or in the future. Exploration in ANWR was once a symbolic vote in Congress. Today it is a real possibility. The oil export ban – a relic of the ‘70s oil embargo – wasn’t even talked about. But it was lifted in 2015 -- during the tenure of a Democratic president, no less – and the U.S. is a world leader in crude exports to our allies. At some points this year, we’ve actually exported more oil per day than most OPEC nations produce per day. Congress has passed historic tax reforms that boost U.S. competitiveness and make it easier for the industry to invest. The Interior Department has proposed a five-year leasing plan that could unlock vast offshore resources for responsible development. And the administration is right to take another look at key regulations, to root out “one-size-fits-all” requirements that may look good on paper, but in real-world operations can hamper safety and stand in the way of deploying the most advanced technologies and practices. On trade, the new U.S. Mexico Canada Agreement protects vital energy trade flows. No one understands the importance of North American trade better than Texas. Trade with Canada and Mexico supports 1 million jobs in Texas alone. And Canada and Mexico are among our top energy customers, purchasing more than 710 million barrels of crude oil and refined products in 2017. The USMCA, or NAFTA 2.0, maintains key market access and zero tariff policies, along with investment protections, that will keep energy trade – and economic activity – going. But that’s not to say there aren’t headwinds. We’re headed in the right direction on trade in North America, but when it comes to trade around globe, we have work to do. Take these two examples. First, the administration’s trade policies applying tariffs and quotas on essential steel and aluminum products don’t just increase costs. In some cases, the specialty products we need to build equipment and pipelines aren’t even available from U.S. sources – a reality that jeopardizes our ability to make the investments needed for the next decade of energy leadership. The escalating trade dispute with China puts our LNG exports in the crosshairs, just as we’ve gained a significant foothold in this major arena. Getting priced out of China’s fast-growing energy market benefits our competitors like Russia and Qatar, and we must find a way to address discriminatory trade practices – a vital objective – without jeopardizing U.S. jobs. Shifting to infrastructure, investment and streamlined permitting is a priority for the White House, and Congress and the administration have made substantial progress in accelerating approval processes. 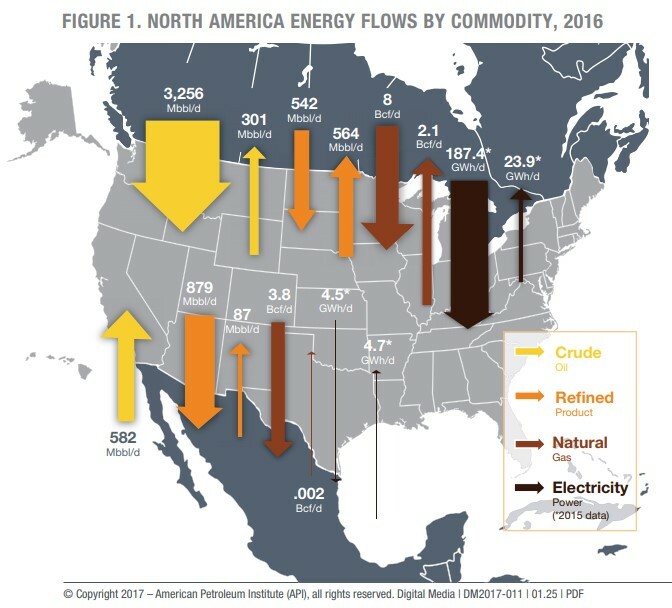 But America’s energy needs are growing. Government projections show natural gas and oil will supply an estimated 60 percent of U.S. energy needs in 2040 and a growing figure around the globe. And we need infrastructure to keep reliable, affordable energy moving to families and businesses – and to break bottlenecks like you’re experiencing in the Permian. When pipeline constraints slow production in our most prolific resource bases, the very heart of the U.S. energy revolution is threatened. This is where mobilizing together to educate consumers is key. TXOGA is doing exemplary work to demonstrate to lawmakers that energy is essential to powering the nation, and we are laser focused on supporting you, including advocating for federal policies to ensure this energy leadership grows. Fuels policy is also a mixed bag. We have bipartisan support in Congress to end the outdated ethanol mandate put in place when America’s energy picture was much different. But earlier this month the administration moved to allow year-round E15 sales – even when three out of every four vehicles on the road today are not compatible with E15. We are deploying a wide array of tools – including exploring legal options – to protect consumers and car engines from the consequences of E15. Continued collaboration between API and TXOGA is critical to overcoming each of these challenges. The vast majority of American voters support U.S. leadership in responsibly developing, producing and using natural gas and oil because they see firsthand how energy enables modern life every day. One, the industry’s safety culture. The men and women of this industry are committed to operating safely, and that permeates every single aspect of their work. We must shine a brighter light for the American people on the 24/7 safety redundancies we employ. Next is the passion for innovation. That applies to safety, but it also applies to increasing production, and environmental stewardship. The industry is producing cleaner fuels while shrinking its environmental footprint and reducing emissions. We must shine a brighter light on how innovating is part of every day for our industry. Lastly, but binding it all together, is the pride the industry has in its work. As well it should. This is an industry that has done more to advance civilization than any other force the world has ever seen. We provide the foundation that makes modern life possible. The American people have a great stake in our success. By working together, and keeping sight of energy’s fundamental value, we can ensure the energy revolution that started in Texas endures. Mike Sommers is the 15th chief executive of API since its founding nearly a century ago. Prior to coming to API, Mike led the American Investment Council, a trade association representing many of the nation’s leading private equity and growth capital firms and other business partners. He spent two decades in critical staff leadership positions in the U.S. House of Representatives and the White House, including chief of staff for then-House Speaker John Boehner. Mike is a native of Naperville, Illinois, and a graduate of the honors program at Miami University in Oxford, Ohio. Mike and Jill Sommers, a former commissioner at the Commodity Futures Trading Commission, have three children and live in Alexandria, Virginia.